Dinosaurs, witches, and pirates, oh my! Two new islands are rolling out with World of Warcraft’s latest expansion: Zandalar, stronghold of the trolls (with the impressive title of being the oldest city still standing in Azeroth), and Kul Tiras, home of a maritime race of humans lead by Lord Admiral Katherine Proudmoore. Blizzard has given us a very different feel in these new zones, which is evident from the get-go. 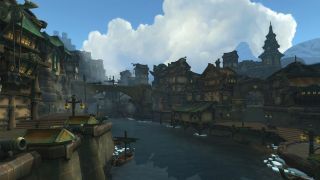 Boralus is the Alliance capital city of Kul Tiras’ questing and main story. The seafaring Kul Tirans pride themselves on shipbuilding and monster hunting. It’s no surprise that many of their abodes (and city in general) are of brigantine design. It’s hard not getting excited by this sort of nautical engineering. And if architecture doesn’t give you a sign of what to expect, there’s a good dash of hostile pirates who want to make your MMO life even more difficult. Tall ships sail in and out of the many canals of the city, showing us the bustling commerce that keeps Boralus prosperous. Outside the city of Boralus, things aren’t exactly as welcoming. The Kul Tiras region of Drustvar is having a witch infestation. This mysterious coven of hags have harnessed the power of ancient, druidic magic, and the wicker beasts under their control will do everything in their power to end an adventurer’s journey. Drustvar’s macabre curses, corrupted animals, and horror-film style design is front and center. In a nutshell, if you don’t like superstitious villagers, pestilent wildlife, or untangling mysteries straight out of a Salem witch trial, this could be a difficult zone for you. Oh, and blood. Lots of blood. Speaking of blood, the Horde region of Zandalar also has plenty of it. You can’t have trolls without ritual sacrifices and a Loa (the troll equivalent of a god) of death. Also, much to the excitement of many, the land is home to a myriad of dinosaurs! Not only do we have undead and dinosaurs to deal with in this zone, but we also get…undead dinosaurs. And who doesn’t want that? Zuldazar will be the hub city for the Horde. This temple city, rising from the highest jungle canopies, is the longest lasting empire on Azeroth. Its cityscape of bright terraces, looming ziggurats, and domesticated brutosaurs show that even after all this time, Zuldazar is still in its glory. Continuing the theme with blood (and how can you not with a land of trolls), the region of Nazmir’s dark skies are dominated by a blood moon. The Cataclysm hasn’t been kind to this region- it’s environment has changed from a lush forest to a primordial swampland now full of infested ruins. There is also a history of titan influence in the area, and blood troll conflict that will require the help of a seasoned adventurer. While Zuldazar is surrounded by verdant jungles, the zone of Vol’dun is a stark contrast with its vast territory of sand dunes and sun. This desert land introduces two new races, the Vulpera and Sethrak. The vulpera are a ridiculously adorable, fennec fox type race. They are clever and mischievous, but most are tragically enslaved by the Sethrak. Vol’dun’s sprawling desert isn’t happenstance. The Sethrak, a race of bipedal snakes, are gifted with the ability to bring sand wherever they go, and it’s obvious they have used this power to form their arid home. Blizzard has given us yet another expansion with zones and capitals that feel new to the world of Azeroth. It’s beautiful landscapes of dinosaurs and nautically themed architecture is a feast for the eyes. Don’t get too comfortable, though! Witches, blood trolls, and a good amount of internal drama simmer just beneath the surface. World of Warcraft’s latest expansion, Battle for Azeroth, is set to launch August 14th.